New Delhi-based diplomatic sources said the Government of India had served Pakistan with 13 separate diplomatic missives seeking access to Jadhav since March 25, 2016. Fears are mounting that Kulbhushan Jadhav, sentenced to death by a Pakistani military court, could be facing a protracted legal battle to avoid execution, highly placed official sources in Pakistan and India have told The reportar. The death sentence was handed down at the end of a rushed trial lasting just hours, without a civilian defence lawyer. Treated as a serving Indian military officer on the basis of a confessional statement made in custody, Islamabad-based sources said Jadhav can now move an appellate military court, followed by Pakistan’s Supreme Court and the President, though he has so far not been allowed access to legal representation. In the so-called confessional video, Jadhav states he will remain in service of the Indian Navy until 2022. However, he also says he “served in the Indian Navy till around 2001 December”. The verdict on Jadhav, sources in Islamabad said, came after an alarm was raised over the disappearance of a retired Pakistan Lt Colonel, Muhammad Habib Zahir, from Lumbini, close to the India-Nepal border. Islamabad suspects that Zahir, a former ISI officer, was probably lured by India’s intelligence services. Zahir is suspected to have played a key role in running terror networks, targeting states on the India-Nepal border. Islamabad-based sources claimed that the civilian government of Prime Minister Nawaz Sharif was not consulted prior to initiating the eleventh-hour military trial, initiated with the approval of Pakistan Army chief Qamar Javed Bajwa. Indian government sources said New Delhi was also not intimated until Sunday evening. On Monday, Khwaja Asif, Pakistan’s Defence Minister, said the judgment should serve as “warning to those plotting against Pakistan”. The judgment, which could set off a fresh rupture in India’s already fragile relationship with Pakistan, comes even as Pakistan’s Supreme Court is hearing litigation seeking action against Sharif for alleged holdings in offshore entitles disclosed in the Panama Papers. Few facts have emerged from the wilderness of mirrors surrounding Jadhav, a Maharashtra-born Indian Navy engineer who ended up running a dhow business out of Iran’s Chabahar, armed with passports identifying him as Hussein Mubarak Patel. 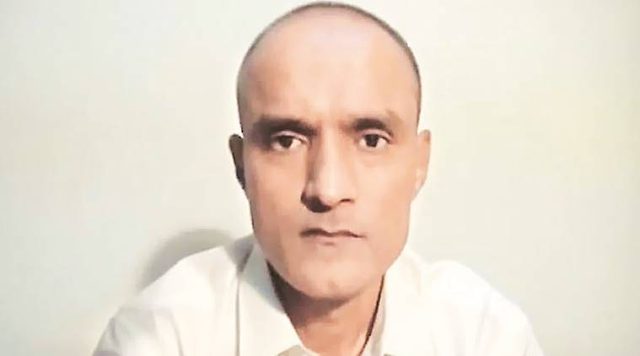 In a videotaped confession released by Pakistan’s military in March 2016, heavily edited with mid-sentence-cuts and containing several contradictory statements, Jadhav said he worked for India’s external intelligence service. Sartaj Aziz, Prime Minister Sharif’s advisor on Foreign Affairs, had been reported as telling the Senate in December 2016 that the country had been unable to complete a dossier on the case, meant for international circulation, because “the material, in our view, was insufficient”. A Foreign Office spokesperson had also said a “dossier shall be completed upon conclusion of the investigation”. India and Pakistan are both signatories to Article 36 of the Vienna Protocol on Consular Relations, 1963, which mandates that consular of any country “shall have the right to visit a national of the[ir] sending State who is in prison, custody or detention, to converse and correspond with him and to arrange for his legal representation”. Tehran’s envoy to Islamabad, Mehdi Honardoost, had last year dismissed Pakistan’s charges that Jadhav was a spy as “one hundred percent false”. Gunter Mulack, Germany’s former ambassador to Islamabad, said he had information that Jadhav had been kidnapped by the Taliban inside Iran Chaman, and sold to Pakistan’s ISI. “Though it is vitally important to protect Pakistan against terrorism,” said Marvi Sirmed, a journalist and human rights activist, “there is no reason to destroy human rights and due legal process to do so. In Jadhav’s case, it was in Pakistan’s vital national interests to ensure consular access and legal due process so that our case was heard and believed by the international community”. With his family refusing multiple requests to comment on the case, piecing together the story of Jadhav’s life has proved near impossible. What is clear is that in November 2003, Jadhav — then still an Indian Navy engineer, on the verge of retiring after 14 years of service — illegally obtained passport E6934766 in Pune, identifying him by the pseudonym Patel. To some friends in Mumbai, who spoke to this newspaper, Jadhav claimed he was setting up an independent business in Iran. To others, he claimed he was beginning work with R&AW. In his confessional video, Jadhav says he was recruited by R&AW in 2013, but adds that he established “a base” in Iran’s Chabahar 10 years earlier. Former R&AW officer Anand Arni denies Jadhav worked for the organisation. “I was a part of the Pakistan desk of R&AW for 25 years”, he says, “and I can state with authority that he was not connected with us. Retired officers are never made assets, and we would certainly never send anyone on a clandestine mission with an Indian passport”. The address given to obtain his passport — the Martand Co-operative Housing Society in the Sai Vishwa area of Pune suburb Bavdhan — was incomplete. The records do not even state which apartment Jadhav may have occupied in the three-building complex. Vijay Deshmukh, secretary of the building society, said records show no apartment was owned by anyone with the surnames Jadhav or Patel. None of the residents recognised Jadhav from a photograph shown to them. Electronic tags linked to the passport show there was an earlier passport also issued to an individual called Hussein Mubarak Patel, possibly carrying visa stamps that made it easy to obtain new ones. Whatever the truth, Jadhav ended up in the Chabahar free trade zone inside months, telling friends and family he was setting up a business to service dhows and ships operating out of the port. Later, he purchased a dhow, the Kaminda, though there are no records of its having docked in Mumbai. Business digests obtained by this newspaper show he tendered for at least one consignment of fertiliser to be shipped out of Iran. In 2014, Jadhav obtained the passport he was eventually to be arrested with in Pakistan, L9630722, issued in Thane, identifying him as a resident of the Jasdanwala Complex of the old Mumbai-Pune road cutting through Navi Mumbai. The flat, municipal records show, was owned by his mother Avanti Jadhav. Even though Pakistan claims Jadhav was aiding Baloch insurgent groups, it is yet to release any details on specific individuals he is alleged to have been in contact with, or acts of terrorism he facilitated.